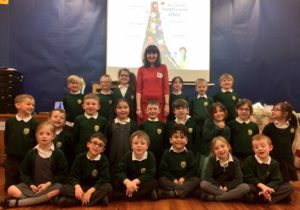 I’ve been doing lots of school visits recently and it’s been so amazing seeing so many children making up their own characters, developing new plots and lit up by the power of stories. 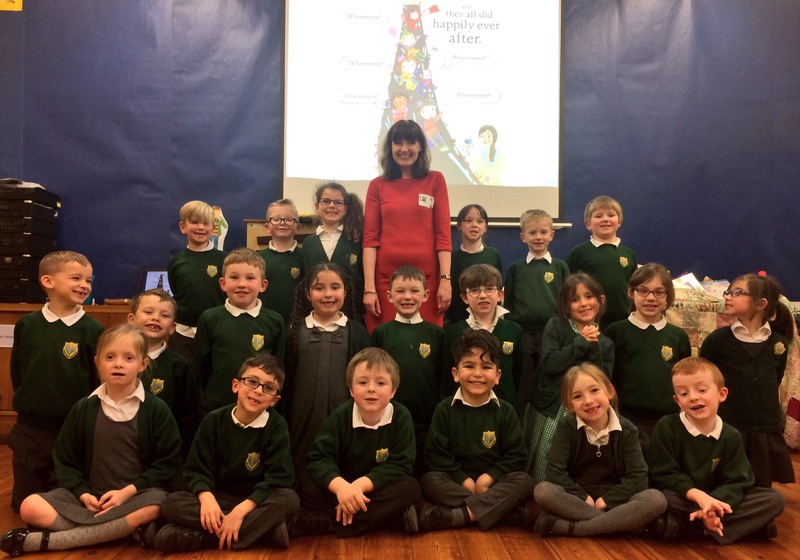 I had a wonderful World Book Day week, visiting schools in Rainham, Romford, Bedford and Norwich, and before that in Ambrosden and many others. I’ve even had someone dressing up as Very Little Red Riding Hood for World Book Day – doesn’t she look brilliant?! I start by making sure we all know the story of Little Red Riding Hood, Cinderella, Sleeping Beauty or Rapunzel. What are the key events in those stories? Who are the main characters? We all know this because fairy tales have been told so many times in so many different ways, that it feels almost as if they exist deep within our brains without us even having to think about it. 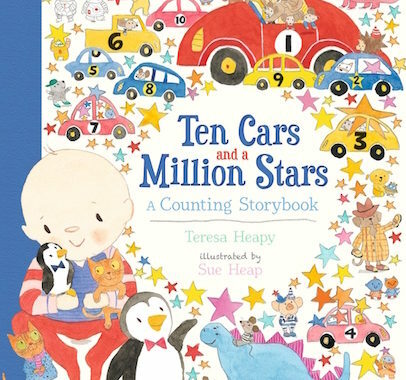 But in our (Heapy and Heap’s!) version of the story, Very Little Cinderella wants to go to a party, the Ugly Sisters are scared of Cinderella rather than the other way around, the Fairy Godmother becomes a babysitter, who has her magic dismissed by Very Little Cinderella – and the glass slipper becomes a ‘lello boot’. I highlight to children that if you want to twist a fairy tale, it’s important to keep some central parts of the story – but then to work out what you can change from this. To begin with, I always go right back to the original and work out What is essential to keep? What defines this story? 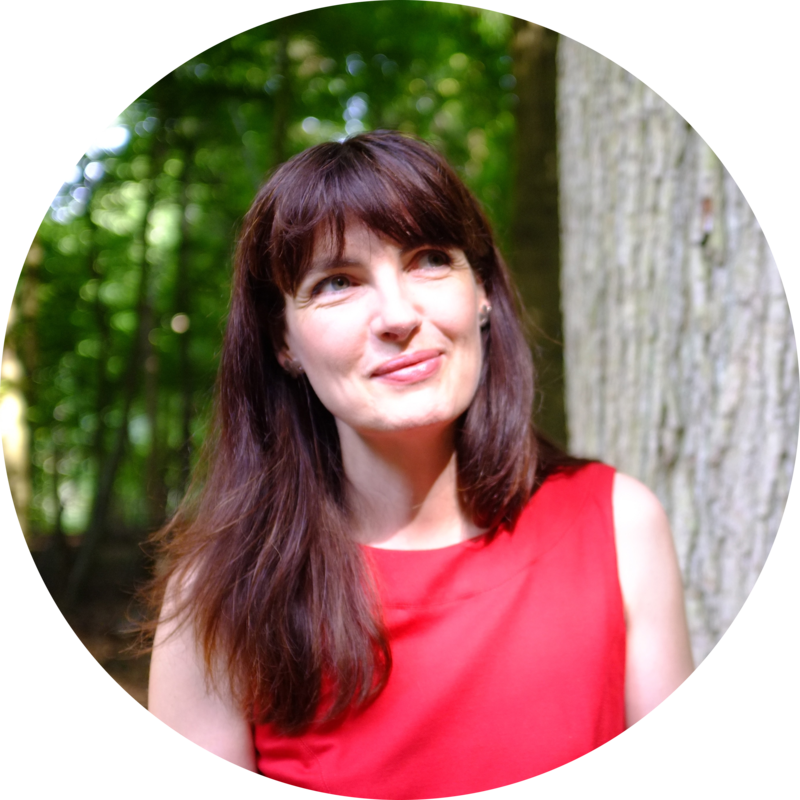 (I use Philip Pullman’s Grimm’s Tale’s – which concentrate on the plot with breathtaking ferocity!) I then work out what I can change, or twist, within the tale, to make it true from a toddler’s perspective. There is usually a key scene that draws me in, like Very Little Red Riding Hood standing up to the Wolf, Very Little Cinderella rejecting lots of magic dresses, or Very Little Rapunzel having an ouch-y time having her very long hair combed! 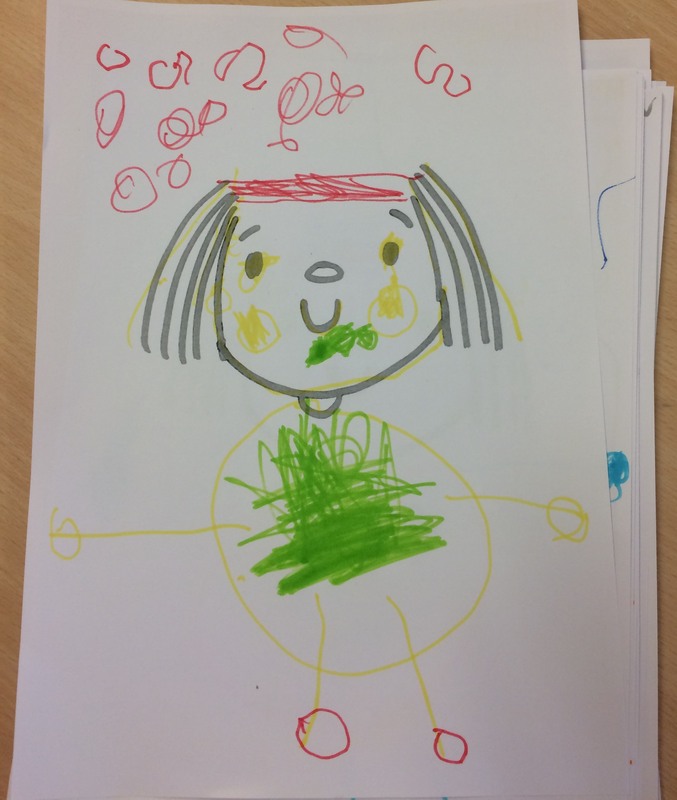 So, having established what is important to keep, I then encourage the children to think about what could change, and to draw and write about their own versions of a Very Little character. 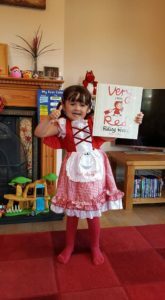 And it’s wonderful to see their brains popping with characters emerging!…I’ve had Very Little Gingerbread Man, Very Little Belle, a Very Little Arial and lots of Very Little superheroes – from Very Little Batman to Iron Man. 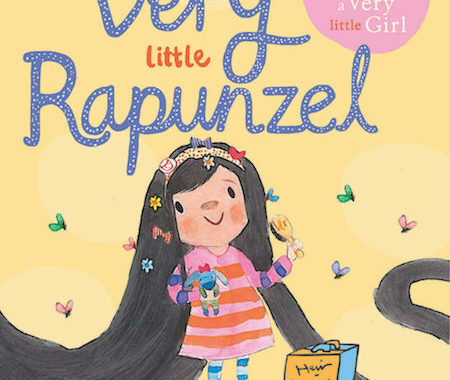 I’ve seen a Very Little Victoria, many Very Little Harry Potters, a Very Little Harlequin Vampire, Power Ranger, Ninja Turtle, Horrid Henry, Gruffalo – even a Very Little Van Gogh (though I did draw the line at Very Little Hitler)! 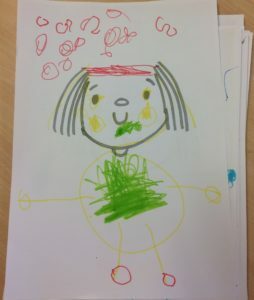 This was done by a pre-school child from Renhold Lower School – note the careful red boots! The oldest can think more about who their characters are – and then start planning where their stories might go. Lots of fantastic very new Very Little characters from Years 3 and 4 at Renhold School in Bedford…who all dressed up for World Book Day! 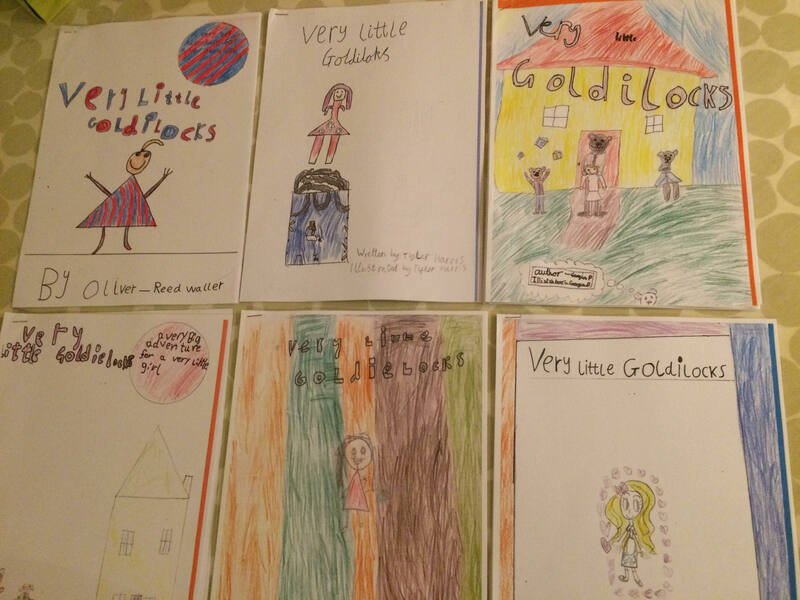 I had a wonderful day with Five Acres Primary School in Ambrosden, where we worked on one idea together, brainstorming Very Little Goldilocks. 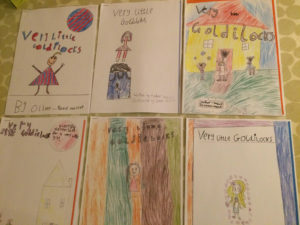 The children then went on to make their own beautiful Very Little Goldilocks books, complete with Very Little map endpapers, blurbs and author biogs, and I’ve been lucky enough that they’ve just sent me some of their finished books. There was such a variety of ideas, and they all twist the tale brilliantly! 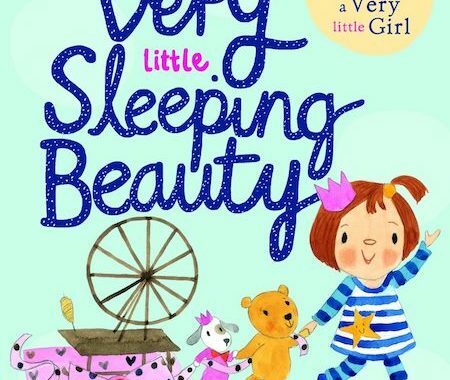 In some of the stories Very Little Goldilocks rejects egg or toast instead of porridge; instead of chairs, she tries out TV programmes or colouring sheets – she even tried to find the perfect toilet! (It’s a big yellow potty.) One of them even travelled in time! A huge variety of ideas on the same tale! You can see of the children reading their stories aloud here. 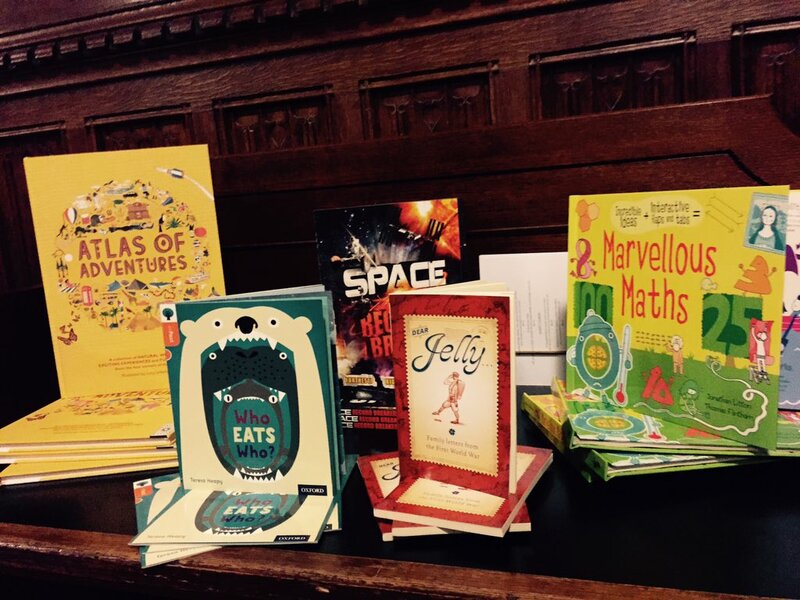 I’m so thrilled to see so many new stories emerging, and so many children seeing themselves as writers and illustrators! A HUGE thank you to all the schools I’ve visited…and here’s to many more!